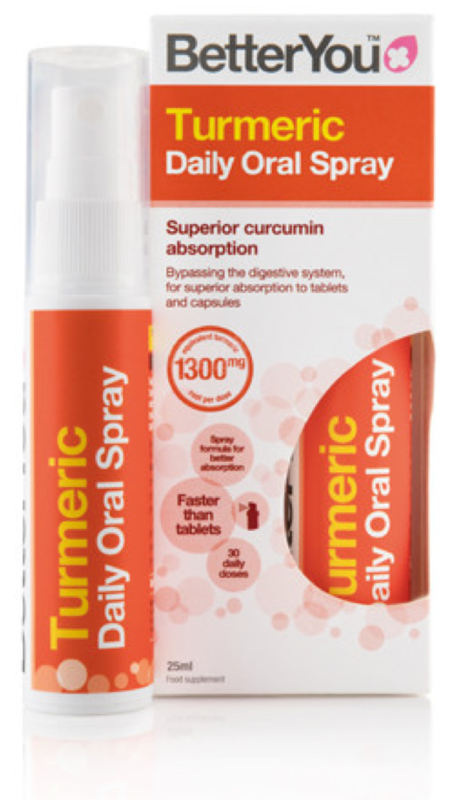 BetterYou™ Turmeric Daily Oral Spray is a revolutionary formulation designed to deliver a greater uptake of the three active curcuminoids, ensuring superior absorption to tablets and capsules, guaranteed! Turmeric, and its component curcuminoids, is notoriously poorly absorbed within the gut with as little as 1% being absorbed into the body. BetterYou's unique molecular encapsulation process (Cyclocurmin®) has been specially formulated to be absorbed directly into the bloodstream, bypassing the digestive system. The tiny droplets absorb quickly in your mouth providing faster nutrient absorption than tablets and capsules. Turmeric is poorly soluble and so relatively unstable in solution. However, by harnessing the science of molecular encapsulation this pioneering oral spray formulation delivers superior absorption through its unique delivery mechanism which bypasses the digestive system (a very well documented absorption issue for curcumin). BetterYou’s, world’s-first, formulation ensures a greater uptake of the three active curcuminoids, with growing evidence of numerous health benefits including immune enhancement and cartilage formation. Cyclodextrin encapsulation – increases bioavailability through increased water solubility, improves taste and reduces staining. ~ Cuts risks of Alzheimer's disease. ~ Liver damage & disorders. ~ Eye problems, such as cataracts.